Yesterday on the SNY broadcast of the spring training split-squad game between the Mets and Nationals, Ron Darling gave his take on Tommy John surgery, suggesting that “everyone is different” in regard to recovery, and while all pitchers get the same prescription for rehab, that doesn’t mean they’ll all heal exactly the same, because everyone’s “makeup” is different. No offense to Darling, but at least two things must be considered. First, while every pitcher gets the same rehabilitation prescription after undergoing Tommy John surgery, not all pitchers follow the program (this is often the fault of the teams). Second, while everyone’s DNA is different, so are their pitching deliveries — and some are more dangerous than others. A human being can’t change his DNA, but he CAN change his mechanics. Unfortunately, very few — if any — pitchers make the necessary corrections to their mechanics to avoid harming themselves again. And therein lies the problem: pitchers — and the teams they pitch for — rarely consider what CAUSED the elbow injury in the first place. It’s chalked up to “bad luck” or some other random, mystical force. Can you imagine what this world would be like today if we took that approach to everything that went wrong in life? Oh wait — we DID do that, about a thousand years ago. We blamed bad weather, famine, plagues, floods, and just about every other negative happening on one god or another. Then, at some point in human history, we discovered — and developed — something called SCIENCE. It’s an amazing thing, this “science” concept — it’s able to explain things, such as why lightning strikes, or why it snows, or why pitchers destroy their elbows. Here’s the best part — unlike the weather, which is uncontrollable (but explainable), thanks to science, pitchers don’t have to destroy their elbows. Scientists know exactly why pitchers hurt their elbows, and why Tommy John surgery isn’t necessarily the answer for a torn ulnar collateral ligament (UCL). Sure, you can take an aspirin or Advil for your headache, but wouldn’t it be even better to prevent the headache in the first place? In most cases, it CAN be done. Similarly, pitchers don’t have to tear their UCL — and those who’ve torn it once, don’t have to tear it again. But don’t take it from me — I’m just a hack blogging from my parents’ basement. Listen below to qualitative scientist and sport kinesiologist Angel Borrelli explain why pitchers injure their elbows, and how it can be prevented. Oh, and there’s a full follow-up on Jonathon Niese‘s shoulder and elbow injury — and you are NOT going to like what you hear. Have a comment? A question for the next episode of The Fix? Post in the comments. 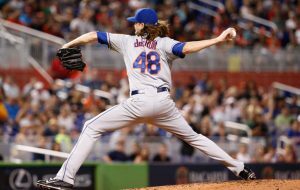 Back Should Mets Bat Pitcher Eighth? 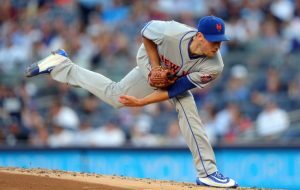 Next Will Mets Roll with Dice-K? Meticated, I’m not accepting a “version” of science — I’m accepting science, period. This isn’t an argument about which way is best — i.e., Charley Lau vs. Ted Williams. Angel doesn’t promote any particular motion — what she does is apply her knowledge of anatomy and applies it toward putting pitchers into safe and efficient positions to pitch the baseball. The body moves certain ways, and when certain parts don’t line up properly at specific times, injuries can occur. Everything she applies is grounded in scientific proof of how the body works — there is no guesswork and she has no new theories on how the body should move to propel a baseball. BTW, it’s not as though I just started thinking about pitching mechanics when I met Angel. In fact, my fascination with the subject began with reading Dr. Marshall’s research over 20 years ago. I’ve been reading and speaking with scientists ever since. What I’ve learned is that I know very little, and will rely on the scientific community to come up with answers on how to keep pitchers safe. Meticated’s skepticism makes sense to me, as Dr. Marshall and Dr. Borelli claim very similar things, regarding their ability to help pitchers improve health and performance. I think the proof needs to come from a track record — which at the moment, at least to my knowledge, is Barry Zito and Kris Medlen’s discontinued use versus Jeff Sparks and Mike Marshall’s zealotry (remember, Marshall was a successful big league pitcher too, and by the end of his career he was using some of the stuff he’s preaching). If I had to pick one, I’d go with Dr. Borelli, but it doesn’t look super conclusive with the scant evidence I’ve been given so far. Of course I respect Angel for keeping players’ names confidential, but without knowing those names, I’m being asked to take a bit on faith here. It does help that everything she’s said makes sense to me, although there is one notable exception (claiming Chris Young’s deception wouldn’t suffer from fixing his awkward motion). That is the point of all this — to get people in baseball to acknowledge that perhaps science can help them. Perhaps, just perhaps, injuries happen as a result of a root cause, rather than randomness. And perhaps, instead of treating the symptoms and surgically repairing the broken ligaments, to go the extra yard and try to figure out that root cause, and take steps to fix it. I think “proven” is the key here. My impression is that Marshall’s motion makes sense to his scientific understanding of human motion, just as the overarm motion (when done right) makes sense to Dr. Borelli and others. They are both informed theories by smart people with relevant knowledge. What I don’t know is how the theory of correct overarm pitching has been proven. Angel logically explaining it doesn’t make it any more true than Marshall doing the same for his theory. Take the wisdom about having the arm cocked by foot strike: it makes total sense to me, and if I were in charge, I’d treat it as true until a better theory came around. But the only way I could claim it’s proven would be if we had a sample of a few million pitches thrown by a few thousand pitchers and we could correlate “these are the guys whose arms tend to be late” with “these are the guys whose shoulders get injured” to a statistically significant extent. As far as I’m aware, this has never been done, nor even anything particularly close. I love that Tim Lincecum’s dad had it put in his contract that the Giants wouldn’t try to change his motion. Everyone who does something different needs protection against those who benefit from the status quo. Interesting idea about the lawsuits. I wonder, could that be an actual concern? I suspect it’s more a matter of disrupting tradition. If you played baseball before salaries took off, coaching or managing in the modern era is a great way to recoup your investment and lessen the tragedy of your bad timing. Bobby Valentine lost his playing career due to injuries, but managed to stay in the game for a few decades until he could manage a few big league teams and earn the big checks that way. For every guy who tried to be Valentine and didn’t get the managerial call, at least there are coaching jobs. Once management realizes that pitching coaches can’t help with injuries, it’s possible that a whole way of life will be disrupted. That said, if baseball lifers should be scared of anyone, it’s not Dr. Borelli — it’s Matheny, Ventura, Ausmus, and the men who hired them. Oops, sorry, posted that in the wrong place. I’ve re-posted below. Parents’ basement? I’m crestfallen. Hey, can Angel Borelli get my 50ish lefty arm throwing 90 after countless abuse of 1,000 pitch days on the stickball field? I’m not sure how well cut out Lannan is for the pen, and Edgin has lost his luster (coincidently when he lost about 5 mph on the heater). By the way, the weather is controllable, we humans just haven’t figured out how to do it. We’re spending all our time trying to avoid TJ surgery and finding the best spot to bat the pitcher. Edgin definitely has mechanical issues — his arm is way behind the rest of his body. But then, Lannan’s motion is really frightening. My conspiracy theorist nephew insists that there are weather machines, and the evil Bilderberg Group used it to create Hurricane Katrina and Superstorm Sandy, among other catastrophes. I prefer to sip my wine and watch baseball than go down that rabbit hole. I’m with you. Pinot Noir and baseball beat the rabbit hole anytime. I see Medlen was one her clients. I’d like her take on what went wrong with him. I don’t think anyone at any level cares about the cause. These kids are now taught to fire as hard as they can. Where did all these 95 mph guys suddenly come fron. And if you blow out your arm Get TJ and they tell you you’ll trhow harder when you come back. And other things they don’t care about. when Wriht got concussed and came back with the big helmet he was barraged with jokes and belittled every day. This set helmets back a decade. And this year baseballshowed off safety hats for pitchers to try during the Spring. did any even try them? Angel worked with Medlen for a period of time after his first TJ surgery. She stopped working with him about a year and a half ago. Since he’s a former client I don’t know if she’ll be comfortable commenting on what may have gone wrong, but I’ll ask. I agree — the goal of every pitcher, at every age, is to throw harder. Velocity is the be-all, end-all, because of that goddamn radar gun. As a result, there are a bunch of ignoramuses coming up with all kinds of wild ideas, theories, methods, etc., on how to throw a baseball faster. Unfortunately, none of these people are scientists, so most of the methods taught are dangerous. There is science to consider for sure, but I can’t recall anyone predicting Matt Harvey would need Tommy John surgery. His delivery was widely praised, yet his elbow gave out. I think ultimately there is nature and science. Both play a part, IMO. David, you have to consider this: WHO were the people widely praising Harvey’s delivery? Were any of them scientists, or otherwise experts on biomechanics or kinesiology? Mark Prior’s delivery was widely praised as well — by baseball people, including Tom House. His delivery was considered so “perfect” that an entire book about the pitching motion was written with Prior as the example. Yet any kinesiologist worth his/her salt would have been able to point out several dangerous issues with Prior’s motion. 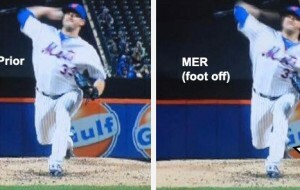 If Angel had access to high-speed film of Harvey from three angles (front, side, and back), she would have been able to identify the reason he tore his UCL. Of course everyone is different — there’s a reason why some human beings can throw 100 MPH and the rest of us can’t. But that doesn’t mean we should ignore science. Shouldn’t we consider science to try to keep people as healthy as possible? Isn’t it better than just sitting back and waiting for pitchers to hurt themselves? i think it is unfair to expect pitching coaches to spot tiny flaws in a motion without high speed cameras and computer analysis. If a doctor needs MRIs and CAT scans, why shouldn’t pitching coaches not need help? Besides, I’d rather pitching coaches focus on body lanfuage and pitch tendancies, etc.. The thing that amazes me is that with all the money now spent on pitchers (from draft time thru to the big time) most teams are negligent in protecting their investments. What are they afraid of? Do you think that Bill Gates or Warren Buffett would not look to maximize their spending by utilizing the best advice available to them? What reasoning is backward? Applying science, laws of physics, and concepts that have been accepted for decades (and in some cases, centuries) by the scientific community? Or not accepting the theories of Marshall, many of which have been evaluated and tested by scientists and have thus far been found inconclusive? Again, I’m not saying that Marshall is wrong. All I’m saying is that I’m trusting science, and so far, Marshall hasn’t produced enough evidence to convince science that his theories should be applied. I don’t care one way or another what baseball thinks about Marshall, because — and I think we agree here — baseball is stuck in the stone age. Meticated, thanks for making that clear. I don’t take offense and I sincerely appreciate your expressing your thoughts and challenging my point of view — the conversation is exactly why this blog exists. What we are discussing here is apples vs. oranges — again, this isn’t Angel vs. Mike Marshall, because Angel is interpreting and applying what has been proven by science, while Marshall has been trying to prove something new. Pitching is a throwing skill that is called “overarm throwing” in science books. There are separate chapters for “sidearm throwing”, and “underarm throwing.” Angel’s expertise is in “overarm throwing” as has been defined by science. Mike Marshall has devised a different way of throwing that doesn’t fit one of those three methods — his “maxline” has yet to be accepted and defined. Additionally, he’s created new terminology that is not accepted by science. For example, he discusses “pronation of the shoulder,” which, according to science, doesn’t exist — the only joints that pronate are the elbow and the ankle. That’s part of the reason he has trouble gaining acceptance with / being embraced by scientists. One day, Mike Marshall’s motion may well be accepted as the norm. We’ll see. Thanks again, this is what makes MetsToday fun.